Built for strong attacking players with quick arm speed the new Ashaway Viper XT1200 is the first Viper racket to incorporate Ashaway’s Hex Frame Technology. 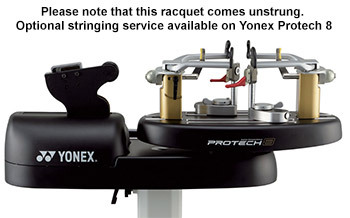 Hex Frame technology sees the racket head cross section as a hexagon rather than a standard oval or box shape. The hexagon shape allows the racket head to be much slimmer and still maintain the strength needed for tournament tensions, the slim profile, and hexagonal shape increase aerodynamics dramatically. The overall weight of the frame is 86g with as much weight as possible moved towards the racket head. The racket shaft is constructed with 40 Tonne Nano Carbon Graphite and reinforced throughout with a Viper Weave. The shaft is mid stiff, the balance is head heavy and the racket head will take high string tensions.